Following a tasty buffet lunch washed down with a little bit of rum, you have the chance to boogie board in the waves or enjoy the solitude on a deserted beach (routes vary depending on local conditions on the day). Return to Puerto Plata with happy memories of the smiling children, stunning scenery and rich culture of the Dominican Republic. Traveling aboard an all-terrain truck you will discover the wide expanses of sugar cane fields and their workers who still preserve some of their ancestral traditions. Go where the tour buses cannot as you enter the depths of the island exploring the unspoiled Dominican countryside. Ride through villages, lush green scenery and sugar cane fields as your friendly guide tells you about the history and culture of the island. See how local fruits, coffee and sugar cane are grown and stop at a fruit orchard to sample some of the local produce. The Chavon River Boat Safari is a great combination of spectacular scenery, cruising and culture. Enjoy the relaxing sounds of nature at its best as you cruise along the Chavon River as your local guide points out the native flora and fauna. Visit a local house where you have the opportunity to see how the Dominican people live and taste the local tropical fruits and rum. Experience the Dominican culture and mingle with the locals. The Chavon River Boat Safari is a great tour for the family, exciting both the little and the big kids a like. Find out why the dolphin swim is the most popular program at Ocean World. During your 30-minute encounter you'll dance, hug, pet and swim with the dolphins. Finishing with a spectacular dorsal fin tow, your dolphin encounter is assured to be the most memorable highlight of your Puerto Plata vacation. Rarely do we get the chance to experience these intriguing mammals up close and personal. Bring the whole family for a fun packed educational day. Your dolphin swim begins with an educational introduction presented by expert dolphin trainers. You'll learn fascinating facts about these amazing creatures and receive important safety instructions for your dolphin encounter - a must for a truly pleasurable experience. All participants in the dolphin swim must wear life jackets (provided) to float freely on the surface, allowing the dolphins to come much closer. A maximum of 10 participants and two dolphins take part in each session, ensuring a truly personal encounter. Tour departs from most Puerto Plata, Playa Dorada, Cofresi and Maimon hotels. A surcharge is charged for passengers transferring from Sosua, Cabarette, Rio San Juan, Bahia Principe, Playa Grande and Luperon (payable direct and only available on certain days). Adrenaline lovers paradise! Here is your opportunity to experience pure adrenaline while in the Dominican Republic! 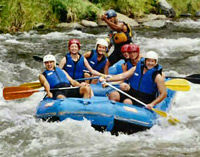 Feel the thrill as you tackle the rapids of the Yaque del North River, admiring the mountainous scenery along the way. A Dominican style buffet lunch will be served to end an absolutely superb day. Here is your chance to experience the thrill of white water rafting. Prepare for a pure adrenaline rush as you battle the waters of the Yaque del North River in the mountainous range of the island. This is one of the most exhilarating adventures in the Dominican Republic. Full tuition and safety equipment is provided prior to boarding the rafts. At the end of the river rafting experience, enjoy a sumptuous Dominican buffet lunch to settle the excitement. Departure Time: 6:30 am, exact pick-up time will be advised at time of booking. A day of history and beautiful scenery as you take in the sights and history of Santiago, the first capital of the Dominican Republic, followed by a visit to Jarabacoa Waterfalls. In Santiago you will visit a cigar factory where you can see them being hand rolled, and also have the chance to buy at factory prices. Also visit a ceramic factory with the ceramic, faceless dolls produced making a great souvenir of your trip. After lunch you will head through the picturesque Dominican Alps to Jarabacoa passing through spectacular scenery of green valleys and clear streams. The waterfalls at Jarabacoa will astound you with their natural beauty as you journey by foot or by horse to the tranquil area. Join a unique tour of the Dominican Republic on an 8x8 Monster Truck Safari. Go where the tour buses cannot as you enter the depths of the island exploring the unspoiled Dominican countryside. Traveling by 8x8 monster truck allows you to see breathtaking landscape while traveling along back country roads, crossing rivers, streams and sugar cane fields. Visit small colorful villages and see how the local people live, their typical homes and a school. For the coffee connoisseur, take some time to taste the locally brewed Dominican Coffee, one of the country's most famous products. Arriving at a riverside location your Dominican buffet lunch awaits, drinks included. Relax and enjoy a swim in the refreshing waters of the river before heading back to your hotel with a whole new perspective on Dominican history and culture. Board the Tropical Storm to enjoy a slow and relaxing sail from Punta Cana, over the crystal clear aqua waters of the Caribbean, along the stunning, white sandy coastline of Bavaro. Start your day with a visit to the wreck of the Astron, a sunken freighter which lies in shallow water close to the shore. Here you can see large schools of blue fish, barracuda and yellowtail snapper. Cruise to a natural swimming pool where you will have time to relax, swim or have fun on the biggest slide in Bavaro! Snorkeling equipment is available on board with instruction available for beginners if required. In the tranquil surroundings with nothing but the sound of the wind and waves in your ears, sit back and enjoy lunch onboard. Later you can enjoy a drink while swimming in waist deep water with a floating bar on hand. Enjoy a lovely scenic bus ride to the dock where you'll board the catamaran and begin your journey. Spend your 3 hours of leisure on the island lounging on the sand, playing beach games, exploring the island or receiving an introduction to Merengue dancing. Your first stop on the catamaran cruise will be for a cocktail at the amazing 'Natural Pool' lagoon, famous for its abundance of starfish. Continue to Saona Island by speed boat for a barbeque lunch served buffet-style under the shade of palm trees. The rest of the day is up to you - spend a couple hours of leisure on Saona Island swimming, playing volleyball, Merengue dancing or simply relaxing with a drink in hand. On the return sailing voyage you'll be entertained by the musical crew as you enjoy the unlimited open bar. Leave your Punta Cana hotel far, far behind as you head into the amazing Dominican countryside with a professional local guide. Learn about the culture and history of this wonderful while enjoying the most beautiful regions of the Dominican Republic, where you will visit a typical country house and taste the local specialties at a local cafe. You will also have the chance to mingle with the locals at the next stop, at an elementary school 'La Seiba'. The safari will then pass by sugar cane plantations to a visit at a cigar museum. After a scenic ride through the countryside you will arrive at a 'finca' where you will be able to see and sample fruits and plants such as vanilla, cafe (coffee), cacao and sweet lemon. After a true Dominican lunch consisting of many typical dishes, you have the option to take a fresh dip into the clear waters of the river located on the same 'finca', go horseback riding or just take a rest in one of the 'hamacas'. On the return, you will visit a local store (colmados) where you will have the opportunity to shop for native products like rum or coffee at very attractive prices. Jacques Costeau, eat your heart out. Walk along the ocean floor and discover the amazing corals and tropical fish of the Caribbean. This is the easiest way to explore the underwater world, its as simple as walking and breathing. On this Seaquarium Underwater Adventure you will discover a submarine wreck, reefs, sting rays, sharks and a great variety of colorful fishes. Imagine discovering all this without getting your hair wet, you can even do it with your prescription glasses on. Slip on the helmet, attach the air tube and you are ready to start exploring. There is no easier way for you and your family to explore below the surface, and discover what lies beneath the turquoise waters of the Caribbean. A professional diver is on hand at all times to ensure your safety and comfort. The Seaquarium Underwater Adventure is suitable for everyone aged 8 years and over. This is an easy and safe experience the whole family will love during your Dominican vacation. Departure Time: Departure times vary. Your departure time will be advised when you call to reconfirm your tour. Pamper yourself in the exquisite surroundings while vacationing in the Dominican Republic. Enjoy splendid comfort while your trained specialists uses innovative techniques to relax you. Your hot indulgent spa package includes a purifying wrap, hot stone massage, spa manicure and pedicure. At Renova Spa you'll find a wide range of services that can enhance your vacation in very special ways. Spa programs are designed to provide splendid comfort and relaxation through treatments, therapy and advanced body care. Let Renova Spa show you the innovative techniques that only a trained specialists can offer. Body wraps are an ancestral practice that provides pleasant sensations and a relaxing effect. This includes exfoliation, application of an elixir, mud application, head and face massage, shower, and body moisturizing massage. This new technique works by applying oils and hot stones on your body to help balance your energy centers thus leading to complete relaxation. Spa manicure will give your hands the image you want to project. The treatment consists of filing and shaping the nail edges, a light massage and softening with a moisturizing cream. All the instruments employed by our specialists are sterilized after every use. Feet are one of the most important parts of the body since they support all of our weight. Unfortunately they are also one of the worst looked after parts. Give them the care they deserve. Experience an aquatic adventure as you drive your own speedboat on the turquoise sea of the Caribbean on a James Bond style adventure. Fly across the waves as you drive your own mini two-seater speed boat - follow the leader along the beaches of Bavaro, with your journey ending at a snorkeling platform. Dive into the clear water to see underwater coral, fish and sea life of all colors. The snorkeling conditions here are excellent and all equipment is included. Expert instruction is available those who need it. Once back on the platform, soft drinks are provided to refresh you for the drive back to the beach. The speedboat ride is supervised by professional guides at all times to ensure your safety and comfort, allowing you to relax and enjoy the thrill ride of your life. Please note: Minimum age for the driver is 18 years. Nothing can match the magic of an afternoon spent cruising the Caribbean. As the day draws to an end, sail on the blue waters off Punta Cana with great views and cool breezes. Start your afternoon with a cruise along the coastline with magnificent ocean views as you depart Punta Cana. Relax and enjoy the music with an assortment of snacks and drinks as the day winds to a close. Enjoy the romantic twilight as your cruise returns just before the sun sinks into the sea.